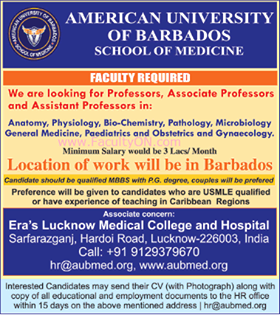 American University of Barbados, Lucknow has advertised in THE TIMES OF INDIA newspaper for the recruitment of Professor plus Associate Professor plus Assistant Professor vacancies. Interested and eligible job aspirants are requested to apply with in 15 days. Check out further more details below. About College: The American University of Barbados is an associate concern of Era’s Lucknow Medical College and Hospital which has a 920 bed hospital running successfully for more than a decade with 150 M.B.B.S. and 90 postgraduate (in 19 Subjects) students being inducted annually. This school of Medicine is located in the beautiful island of Barbados which is called “Gem of the Caribbean”. It is a coral paradise with beautiful sandy beaches and is an ultimate holiday destination. The beauty of the place has rubbed onto every Barbadian heart, there is a smile on every face and twinkle in every eye. Their motto being “Long Live life”, which could well be the one liner for the American University of Barbados.